AG Jeff Sessions Holds Stock in Private Prison System-Fiction! - Truth or Fiction? AG Jeff Sessions Holds Stock in Private Prison System-Fiction! Attorney General Jeff Sessions holds stock in the private prison industry and stands to benefit financially from decisions to restore federal use of private prisons and to seek maximum penalties for nonviolent drug offenses. Financial disclosure documents don’t support rumors that Attorney General Jeff Sessions holds stock or ownership interests in the private prison industry. Those rumors first surfaced after Jeff Sessions reversed President Barack Obama’s order to phase out federal use of private prisons shortly after Sessions’ confirmation in February 2017. Rumors spread again in May 2017 when Sessions reversed another Obama order that federal prosecutors seek minimum sentences for nonviolent drug offenders. Private prison stocks have soared since President Donald Trump took office. 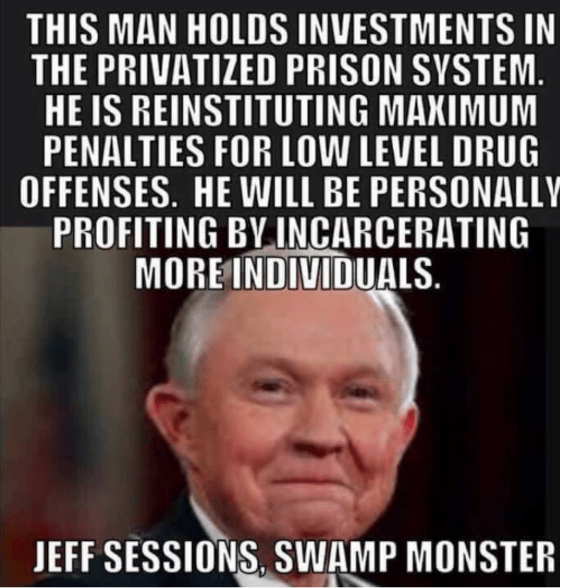 Rumors that Jeff Sessions has stock in the private prison industry stem from unsourced memes that have been circulating since February 2017. It’s not clear where, exactly, the claim started, but it has spread across social media in different forms going back to February 2017. Memes claiming that Jeff Sessions holds stock in private prisons have been circulating since February 2017. These claims aren’t supported by financial disclosures that Jeff Sessions provided during his Senate confirmation. As a cabinet appointee, Sessions was required by law to provide an itemized accounting of his financial holdings, which can be found here. Stock in private prison companies doesn’t appear anywhere in those disclosures, and it would be a violation of conflict of interest statutes for Sessions to take action on private prisons if he held stock in them. The seeds of Sessions’s evangelism for private prisons, and the future of the industry, were sown back in October, when two of his former Senate aides, David Stewart and Ryan Robichaux, became lobbyists for Geo Group. Stewart and Robichaux, who represent the lobbying firm Bradley Arant Boult Cummings, were specifically hired to deal with federal government contracting. The bet that Trump might win the presidency, and tap Sessions, one of his earliest supporters, for a powerful position in the government, paid off. It’s not like Sessions wouldn’t have boosted private prisons had his staffers not gone to work for the industry. Trump touted private prisons as far back as last March. And Sessions’s history with the industry goes back 20 years. As attorney general of Alabama, he approved the use of private prisons in the state in an advisory opinion in 1996. As senator he helped secure a federal contact for undocumented immigrant detention in a facility in Perry County, Alabama, though it was eventually canceled. In a 2010 hearing, Sessions said, “I do think there is a role for private prisons in the American system,” backing a nominee to run the US Marshals Service who had ties to the industry. In the end, claims that Jeff Sessions holds stock in private prison companies are fictional. However, both Sessions and President Trump have deep ties to the private prison industry — and the industry’s largest companies provided financial support to Trump’s campaign and inauguration before benefiting from policy decisions made by Sessions. German Government Confiscating Homes to House Refugees-Truth! & Fiction! Cosmic Rays from Mars will Damage Phones, Electronics-Fiction!